As a key team supplier and sponsor, Spectrum provides the fuel system to Sikorsky in kit form for installation into the RAIDER aircraft. Based upon considerable prior experience, Spectrum designed and obtained a tool which duplicated the aircraft bay for form and fit purposes. This allowed us to verify that the fuel system and its numerous components, plus our own proprietary breakaway valve assemblies, would be installed with a minimum of effort and without delay or mishaps. Spectrum is currently working on the system for Aircraft 2 and eagerly anticipating the first flight of this cutting edge aircraft in early December 2014. It's not every day you see a helicopter that looks like this. But that unconventional rotor placement will help drive the S-97's exceptional speed. The Sikorsky S-97 Raider has an unusual configuration, with two coaxial main rotors on top and a pusher propeller in the rear. First came the superfast X2 helicopter. 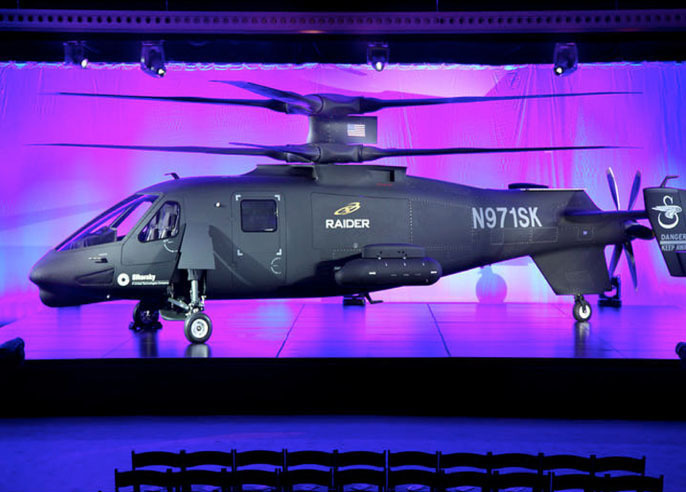 Now Sikorsky Aircraft has put that experimental technology into a more mature package, the S-97 Raider. Sikorsky hopes that the sleek, speedy design of the S-97, unveiled Thursday, will win the favor of the US Army as a potential replacement for OH-58D Kiowa Warrior helicopter, an airframe whose history dates back to the Vietnam War era, and as an aerial platform for special operations units. The S-97 will be much faster than conventional helicopters, with a cruising speed of up to 220 knots, or 253 mph, according to Sikorsky. The Kiowa, which has been the Army's primary scout helicopter since the mid-1990s, by contrast has a cruising speed in the area of 120 mph. It's not an idle promise. In September 2010, Sikorsky's similarly designed X2 technology demonstrator reached a speed of 250 knots (287 mph), a feat that the longtime rotorcraft maker at the time said "unofficially shattered the helicopter world speed record." That feat has since been eclipsed -- by a slim margin -- by the Eurocopter X3. Those high speeds for the X2 and S-97 stem from a combination of next-generation technology, a streamlined fuselage and, most dramatically, a striking reconfiguration of the standard rotor setup for a helicopter -- two stacked main rotors and a pusher propeller at the tail. In late May, Sikorsky first turned on power to its S-97 prototype, which at the time was about halfway through assembly. It's not an everyday look for a helicopter, to say the least. The two main rotors of the S-97 are coaxial, and they rotate in opposite directions, driving both lift and forward flight. That counter-rotation has the benefit of balancing out the torque and evening the lift from the long and rigid spinning blades. The coaxial design is uncommon, but not unprecedented -- it's long been a distinguishing characteristic of helicopters from Russian manufacturer Kamov. It's also a more complex beast than a traditional single-rotor configuration. What's even more unusual element is the pusher rotor at the rear. Where a standard helicopter uses a side-facing tail rotor to offset the torque of the main rotor in front, the pusher propeller of the S-97 will assist in high-speed acceleration and deceleration. 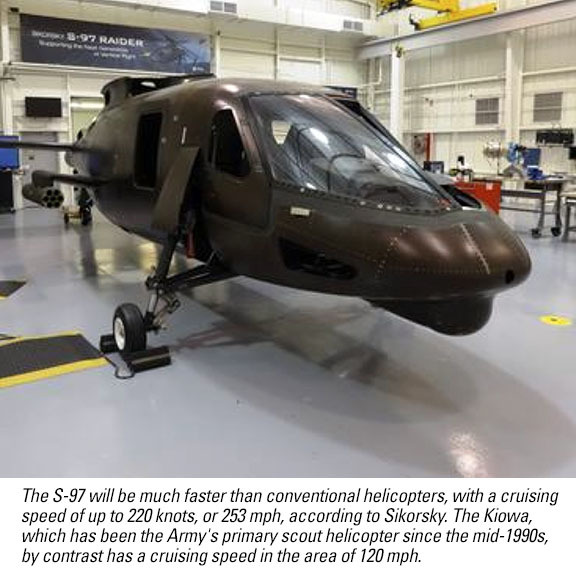 The S-97 prototypes, Sikorsky has said, will go beyond the X2 aircraft in several ways, demonstrating precision maneuvers in low flight speed, high G turning maneuvers at over 200 knots, and hot-day hover performance at altitudes up to 10,000 feet. When all's said and done, the privately funded S-97 program will cost Sikorsky and its partners $200 million (75 percent from Sikorsky itself) for the construction and testing of two prototypes, the first of which was on display Thursday. "Sikorsky will begin ground testing shortly and is on track for first flight this year," Steve Engebretson, Sikorsky's director of advanced military programs, said in an emailed statement. "The entire rest of the flight program will take about a year to complete." The company plans to demonstrate the aircraft's capabilities to the US military beginning in 2015. In a separate project, Sikorsky is working with Boeing on an X2-based helicopter called the SB-1 Defiant in a precursor program to the the Army-led Future Vertical Lift initiative, which aims to find a next-generation medium-lift helicopter for use across all the military branches. The first flight for that program is expected in 2017. With a composite airframe, the 36-foot-long single-engine S-97 prototype has a maximum gross weight of just over 11,000 pounds. (The X2 demonstrator had a gross weight of 6,000 pounds.) The cockpit will seat two pilots side-by-side, and the cabin behind them will fit six combat-equipped soldiers. The aircraft, which will feature fly-by-wire controls, will be able to carry a variety of external weapons and sensors to suit missions including light assault or armed aerial scout. The US Army has not yet made any formal announcement about a long-term replacement for the Kiowa. Last month, the Army saw its final class of eight aviators complete Kiowa flight training at Fort Rucker, Alabama.